Let’s see each step in details! In order to be able to see the created calls in the system, you have to get access from the PBX for your application. You can do this by generate a Security Token for your program and with that token you can connect to PBX. We can get a Security Token through HTTP API (if it is enabled), or we can generate it in the system after logging in with the GenerateSecurityToken Command of the HTTP API Tester. To get a Security Token through HTTP API, you should send a simple HTTP request to the PBX and the needed token is going to be in the given response. In the code example below you can see what request parameters should be sent to the PBX. On the summary page below you can get further information about the HTTP API and the commands of it. The other method for getting the needed Security Token is that you login to the PBX and generate the token on your own with the aid of HTTP API Tester. 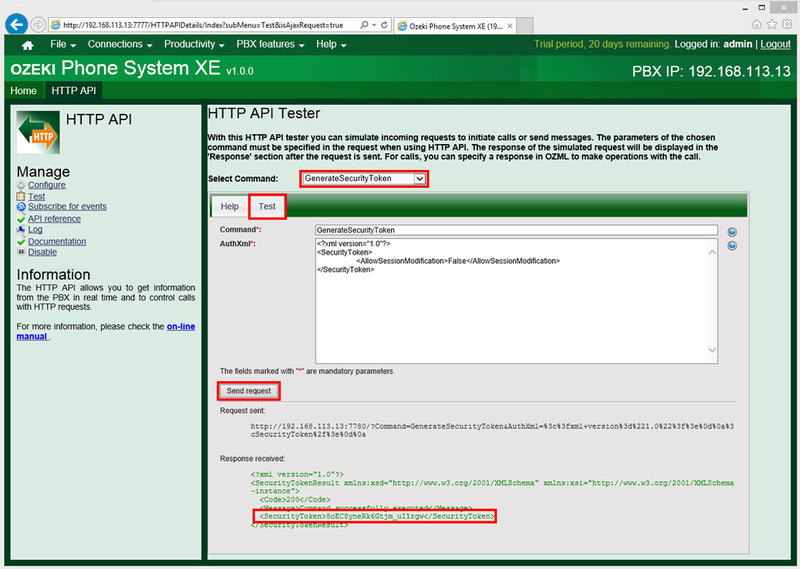 For this, choose the Productivity/HTTP API menu fom the menu line above in the PBX. Then choose the GenerateSecurityToken Command, click on the Test tab, then to the Send request button! The generated Security Token can be found in the received response between the <SecurityToken> tags. Code example 4 - The basic HTML page that is going to be extended step by step. When you are ready with this, you can start to write the more interesting code parts. First we will see some variables and the connection. The numberToSubscribe should be a phone number. We take it as a basic that we are curious for the events of only this phone number. But in case of a need it is extendable, of course, and this requirement can even be left. After clarifying the role of the variables we can see the real connection. Before we connect, we should subscribe for the OzWebClient.onConnectionStateChanged event. We can achieve this by subscribing the connectionStateChanged method that is going to be mentioned later. After this we should call the OzWebClient.connect method. There is the address of the PBX and the requested Security Token. Code example 7 - Subscribing function that gives back the response of the PBX to the login request. Code example 8 - Function that is called when a call is created. We subscribe for the changes of the call state in the function, so every time when it gets into another state (Setup, Ringing, Incall, Completed etc. ) we receive a notification through the sessionStateChanged method. Code example 10 - A function that executes the showing of a Popup. We can see that when the Popup is not in the foreground, we create it, having uploaded with the appropriate values. If we have already showed this dialogue earlier, we modify its values.